Bluetooth speakers are hot these days, especially when you can easily carry them around to use in places where big speakers would be a hassle. The speaker we're discussing today belongs to the ultra-portable class of bluetooth speakers as it easily fits in your pockets. In this branch of speakers there's a lot that can go wrong with the speaker. Due to their small size, many ultra-portable speakers are limited in volume, warmth, depth and battery life. Bang & Olufsen is convinced that they've found a way to bypass all of these limitations, the solution they found is on our testbench today. The Beoplay P2 forms the cheapest and smallest in their range of bluetooth speakers, but they claim that the size doesn't compromise the bass or the overall sound quality. Because the Beoplay A1 was a real hit, we're interested in how this speaker will perform. Aside from being a simple bluetooth speaker, this speaker offers a little more than you'd expect. The P2 has no control buttons, only an off and on button on the back. Instead it's supplied with the ability to understand gestures or voice to control its music. By simply tapping or shaking you can easily pause/play or skip to the next song. In the Bang&Olufsen app, you can change the control settings of the speaker to voice so that you only have to hit the grill twice to activate google assistant which you can then demand to play a specific song in your playlist or simply pause/play or skip. By adding these features, the P2 is not just an ordinary controlled bluetooth speaker, it approaches the usability of popular smart speakers like amazon's echo. The speaker connects over bluetooth 4.2 Low Power, has a microphone, charges using USB-C and has some basic splash resistance. Beoplay claims that the battery is able to deliver up to 10 hours of music on moderate settings. A simple packaging safely covers the P2 with foam, including nothing more than the speaker and a USB-C cable to charge the device. The speaker is wrapped in some plastic and beneath it you can find a quick setup guide for first use. The speaker is much smaller than I first thought as it's only 14 x 8 x 2.8 cm big. A first look at the design will make you wonder, where are all the buttons? Good thing that the small guide on the speaker told me that the B&O mark on the back was actually a button, otherwise I would have been looking for the power button for a long time. Another thing that I noticed was the lack of ports, only an USB charging port is available as input. If you find it necessary for a speaker to have jack input for your audio, you're at the wrong address with this one. The speaker only features bluetooth as input, most of us don't need more than this. 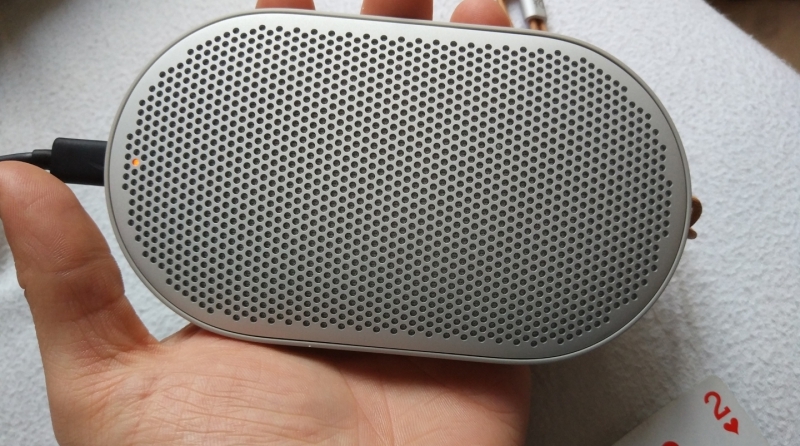 Bang & Olufsen did a great job with the design, it's stylish, simple and firm. While the speaker is lightweight, it consists of high-quality polymer, aluminium and rubber to create a very solidly built speaker. It really feels like a premium product and can take some serious hits before cracking its shell. The leather strap makes it even easier to carry the speaker around. It also makes it possible to leave the speaker hanging on a good spot. The speaker is splash resistant, for its price we'd expect that'd have been full water-resistant like some competitors such as the Bose Micro. As mentioned above, the speaker has no control buttons. Controlling the speaker is done through gestures which you can setup with the Beoplay app on your smartphone/Iphone. Tap and shake interactions work great, but we encountered some problems with the google assistant as it kept saying the device (our smartphone) was locked, while it wasn't. This however could be our problem and ours alone. The microphone that comes with the speaker is pretty good as it easily picked up my voice and what I was saying. B&O chose USB-C for charging which is nice as most new products are taking over this standard. Having one charger to charge them all is easy and when you forget your charger there's a good chance one of your roommates has one that fits your needs, especially when we're looking into the near future when all devices adapt USB-C.
We've tested the speaker with a volume setting around 70% to get an idea of the battery life. After 9 hours of playback time the speaker stopped playing, which is very good for a speaker this size. Also charging the speaker goes fast, 30 minutes of charging will give you around 3-4 hours of playback time on moderate volume settings. Charging the speaker from 0 to 100% takes around 2 hours and some minutes. Does it live up to B&O's high standards? Yes it does. While the speaker is compact in size, it puts out an impressive sound with a relatively good bass presence. The speaker packs a single tweeter alongside a mid-range driver, resulting in mono audio, which is not a bad thing considering that any stereo setup in such a small package wouldn't even sound as a stereo. Because the speaker has a mono setup, the drivers are larger and deliver a more powerful sound than a stereo setup in this package would deliver. With a well-tuned mid-range and a good amount of low-mids, the speaker delivers a rich and warm sound. High frequencies present in vocals, guitars, ... are very tight and clear. Even on complicated tracks, the sound isn't muddled like seen in so many other speakers. While the speaker sounds best in the 60-80% volume range, the extra loudness is welcome to be able to host a small party. You'll probably find louder speakers for this price, but for its size it's difficult to find something that matches the powerful sound that is produced by the P2. Many smaller speakers sound incredibly shrill when playing on max volume, this is not the case with this speaker. Bottom-line, the audio performance on the Beoplay P2 is outstanding for its size and sounds even better and louder than some bigger bluetooth speakers. When you're looking for an ultra-portable speaker with great sound and build quality, the Beoplay P2 is the speaker you seek. It has a steep price-tag (150 euro), but what do you expect from any product from Bang & Olufsen? While it costs alot, you get the best sounding speaker for its size. However, for the given price we'd have expected the speaker to be fully water-resistant like for example the Bose SoundLink Micro. The speaker is well-designed and looks very good. They implemented the use of gestures (shake and tap) to keep the aesthetics of this specific design. These gestures work good, but we'd still rather have some physical controls on the product itself. With the Beoplay P2, Bang & Olufsen adds another strong product to their line of bluetooth speakers. A gold award is what suits best for this tiny, but impressive sounding speaker.